Movie adaptations are a tricky business. You have to stay as close as you can to the original material while adapting it from one medium to another. Often, the script is an earlier version, containing scenes or characters cut from the final film. That’s without factoring in the artwork and maintaining likenesses. One of the best film-to-comic adaptations is of Ridley Scott's original Alien. It was published in Heavy Metal back in 1979, and Titan Books put out a gorgeous rendition, Alien: The Illustrated Story just in time for the release of Prometheus. The book’s cover tells you exactly what you’re in for. Walt Simonson’s rendition of the xenomorph is utterly terrifying. You can’t tell from the image above, but this is an oversized paperback; Heavy Metal is a full-sized magazine, giving the artists more room to work. As a result, the xenomorph on the cover is gigantic, taking up 2/3 of it while lunging diagonally at the viewer. The xenomorph’s most inhuman feature is its head, and Simonson takes advantage of the angle to show off the elongated, eyeless cranium. The reverse has the image of when the crew finds the Engineer’s ship, which makes up a massive two-page spread on the inside. It’s as breath-taking in the comic as it is in the film. Archie Goodwin sticks very closely to the plot and script. Most of the dialogue is intact, including the cursing, which sort of surprised me, though Heavy Metal has always been raunchier than normal comic books. The character voices are all solid, but some of the characters run together, especially Kane (John Hurt) and Brett (Harry Dean Stanton). It helps that Dan O’Bannon’s original screenplay is excellent, with a crew of competent people and one sinister android. I do like that Ash’s bizarre “running in place” spasm was cut; I never quite got why he did that. Goodwin and Simonson first collaborated on Manhunter, and Simonson’s sense of storytelling is top-notch. He’s not afraid to come up with different panel layouts, such as having smaller panels on top of what would otherwise be a full-page spread, which is one of my favorite illustrative techniques. One great example of their combined storytelling skills comes at the very beginning, with the classic scene of the crew awakening from hypersleep. The lights come up over the controls and Dallas’ eyes slowly open over a series of four panels. I do need to mention the ingenious title illustration, which looks like it was drawn by H.R. Giger himself. Goodwin pairs it with a quote from Joseph Conrad, whose books provide the names of the Nostromo and the Narcissus. Simonson also keeps the characters looking like their respective actors. The film’s centerpiece -- from the discovery of the ship to the chestburster -- actually plays out better in the adaptation. In this version, the ship is discovered in daylight, so you can see even more of the details. This might simply be a function of changing mediums, since the stormy night of LV-426 never lets up in Alien or Aliens. At first, the discovery of the Engineer’s body seems a little less grand, but if you look closely, it’s another case of layering panels on top of a splash page. All of the grandeur is still there beneath the storytelling. A row of panels conveying the opening of the egg is still suspenseful, even though you know what’s about to happen. In the dinner table scene, Kane looks even worse than he does in the film, and the ensuing chestburster scene has one major advantage over the film. This time, we don’t see it scurrying away in a silly manner. I think Spaceballs had it right when they redid this part of Alien and redubbed it with “Hello My Baby.” In this case, we don’t see the chestburster’s legs -- instead, its lower body is blocked by a stream of blood, and there’s only a bloody trail showing where it went. The chestburster is also much, much larger in this adaptation, and it’s not just a matter of it being drawn so that it’s lunging at the reader. Goodwin and Simonson actually kept the adaptation as scary as the film, which is impressive. There’s actually a third component to this creative team: John Workman, the best letterer in comics. He’s known for the dramatic sound effects in Simonson’s The Mighty Thor, but here, he creates the sense of the Engineers’ message with a stream of broken-up red letters. When one engine on the Nostromo lights up, he draws a massive “BRAMM” over it. Brett’s message to Kane after he’s been attacked by the facehugger has blood dripped on it, almost as if blood has been sloshed on the “camera.” Even the computer language, when Brett and Ripley communicate with Mother, has an interesting red and orange tone to it. The colors have been completely redone for this edition and look spectacular. Walt Simonson’s artwork and the Aliens franchise are two of my favorite things in comics, and it’s pleasing to know that the two have come together. For a long time, Alien: The Illustrated Story was a lost gem. Along with this edition, there’s an even larger “Artist’s Edition” which features Simonson’s original pencils and various stages of creation. 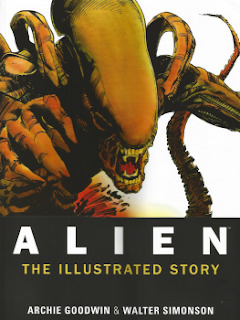 It’s a tempting buy, but for now, if you’re a sci-fi or horror fan, make sure to pick up Alien: The Illustrated Story. Great review! I enjoyed reading it and now I'm about to read the actual material.